Impossible what you ask. What would you want me to do? There are only seven episode slots. Episodes with 30 or 60 levels? I don't see how that makes sense. It should stay the way it is. You don't like it? Remove it in your local copy. It's that simple - and not the first time I suggested it. I can't add any contents for the time being since I don't have either the time or motivation to do so. I have done almost nothing else than this compilation stuff for the last couple of months. I am sure it's understandable that a break is needed. I will review all the suggestions later on. I second NF (see his last post above). Plus if you want all user maps in one pack, simply drop 'em into the same folder and run 'em from there (since I'm pretty sure that's what you're implying). Simple as that. I already knew about what you guys suggested. My suggestion was mostly about making the addon directory a bit more cleaner and for those who want to play the user maps addon, they can just directly select that user map pack addon and play. Also about episodes, I'm not seeing what's so bad at having episodes with the full 64 levels allowed per each episode but it's your choice anyway, I'm not here to force you to make changes about my personal preferences. OK I guess I will shut up now. Maybe the groupinfo feature will support subdirectories and loading multiple groupinfo files at once one day. Then it may be possible to have optional parts of the compilation in separate directories which you can easily add of remove as you please. However, that depends on the coding team and whether or not they consider this as a desirable behavior. 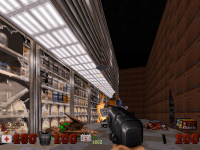 It may sound like a silly idea...but why don't you make some kind of an archive where you can download eduke-compatible versions of the mods you want to play WITHOUT the whole pack? It can be either a site with full mods or with certain files that needs to be fixed . I just don't want to download the entire pack and then delete mods I don't want to play. The idea is actually not too bad. The groupinfo file can be provided for everyone. It contains info to run all the addons you can download. Then it's up to you whether you want everything or only some of them. Updates of single addons would also be much easier. You don't need to download everything again, just the new files (if you are interested in those). A complete version would still be available, of course. Now you can download any updated groupfile as it happens. Just don't forget to get at least the groupfile AND addons.grpinfo! For now, I can only provide a download on Mega since my Dropbox account has reached the limits of its capacity (2.5 out of 2.75 GB). So you've done a slight rearrangement according to Sanek's advice. And I gotta say it's pretty convenient and definitely will work out for everyone! And thanks to Sanek himself for the idea! P.S. : I hope you'll manage to find an alternative to keeping a MEGA storage for all this. My current Dropbox capacity is 2.75 GB. I would need to double its size to be able to put the uncompressed project files there as well. It can be increased without paying, but for that I would need help from other people (or cheat a bit xD). Here's an even better idea: you can make the same archive, but only with .BAT files that will run mods in eduke format. The content can be downloaded elsewhere. Not sure if it will work with all the stuff out there (especially the ones made for 1.3. version), but you can save a lot of space that way. Now for bug reports, thankfully I managed to find a couple of bugs and not only some more typos in the readme files but also some actual bugs (though some are just about textures) in maps. There are some untextured parts of maps (if they are viewed outside with NOCLIP) and also a bug where the inventory isn't reset properly. And that's why these areas are untextured. You aren't supposed to cheat. It's nothing that needs "fixing". Well other space maps have the walls textured even if viewed from outside. 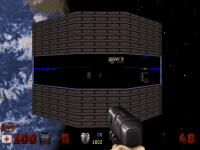 For example YMF500G by Alejandro has the walls textured when viewed from outside and same goes to many other maps, including maps from the original game. The other map from the screenshots 2 and 3 has an area at beginning that is untextured and you can access the area normally. I showed how the wall looks from surface and how untextured is when you are underwater. I'm sure that one needs fixing since probably the author forgot to texture it and left like that. What do you think of my other bug reports and suggestions? I deleted the previous screenshot that showed the wrong location. That is not a missing texture. The author chose this texture for the pool shaft. Maybe it could have been done better, but it would be an edit that changes the visual appearance of the map which is not the goal of the project. 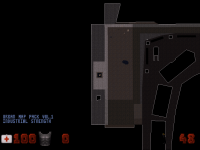 - The map in Urban Map Pack not starting as intended (without weapons). A simple edit of reset.con can fix that. - Merging the two Operation Blitzkrieg episodes together is possible without risking issues (skyboxes simply wouldn't work in 8-bit mode, but they can still be defined). Vesmir: This area isn't supposed to be viewed from this side, so it can be ignored. 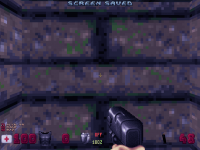 Sprawl: The sprite in question is aligned properly in 8-bit mode (to the front side of the wall, not its bottom). In Polymer, it moves somewhere else for unknown reasons. Already saw this in other maps. Renderer issue, needs to be addressed by the coding team. Metro Mayhem: I intentionally did not remove the other 4 episodes since the team asked me to change as little as possible. MM is supposed to be selectable as a 5th episode to give it a semi-official touch and also to make clear it was made with the previous episodes in mind. The rest I would classify as cosmetic and optional. OK, now I understand. As for Sprawl, I was using the software 8-bit render, not Polymer, so that seems weird to me. I could try checking in Polymer mode to see how it looks. TIP: Sort files by "Date Created" to see updated files on top of the list. NOTE: duke007.grp and verminclear.grp are already updated since Nov 18. If anybody wonders why "Ghetto" (moviemax.map) was removed from the Urban Map Pack: Paul had contacted me a while ago with the request to remove this map since it was his first. He is not very fond of it by now and doesn't want it to be put into the spotlight like this any longer. I respect his wish and withdraw the map from the compilation. To compensate, I have added a very recent map: "Bad Case of Mondays" by Thedutchjelle, released in November 2016. If anybody wonders why "Ghetto" (moviemax.map) was removed from the Urban Map Pack: Paul had contacted me a while ago with the request to remove this map since it was his first. He is not very fond of it by now and doesn't want it to be put into the spotlight like this any longer. At least the level's not been pulled from any level hosting sites, I guess (well, CGS has it, at least). I guess that would go too far. 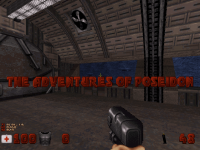 Paul just was uncomfortable with this since it's from 1998 and he created much more sophisticated levels later on (which I couldn't include since they are lagging like crazy in Polymer). Maybe he will create a better version later on, but until then, I will fulfill his request. Anyway, I liked "Ghetto" quite a bit personally, otherwise I wouldn't have included it in the first place. If you want to salvage the map for future usage (since I applied a couple of smaller fixes to it), extract it from urban.grp in v3.1.1 or earlier. I would like to see Paul remaking that map in the future, just like how Merlijn remade Red 1 and 2. Ah so that's why you don't add more recently released levels as they lag in Polymer. I still think you should include them and mention in the readme file that the maps are unplayable in Polymer, so that people can choose to play them in Software or Polymost. Anyway congrats on the new release. 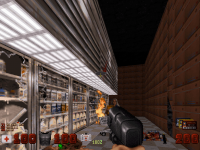 IIRC some maps by MRCK and the Oostrum brothers even used joke textures like the Mickey Mouse sprite in cheat-only areas. I can't make Shark's Cove load Duke Caribbean. I copied VACA15.SSI into EDuke32 directory and while it got recognized by the launcher, Shark's Cove still launches in normal Duke3D Atomic. 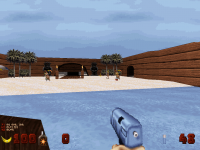 I also tried with vacation.grp file that was converted by Duke Caribbean Plus and got the same thing except for the fact that it isn't even recognized by the launcher. It would definitely not work with ssi files. It's pulling in vacation.grp and only that. If I am not mistaken, it's also stated in the readme that vacation.grp is expected. By doing it like this, it's at least possible to play with any vacation.grp available, so it doesn't expect a specific checksum (translated: it won't matter if you use the groupfile from Megaton or any other). Try putting vacation.grp into the "addons" folder if you haven't tried that yet. 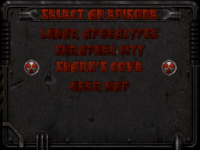 In general, I was never a fan of adding Shark's Cove because I hate addons that depend on others to work. Especially because it's something that prevents it to be used by everybody (for there are people who didn't buy Megaton). Anyway, since EDuke32 is checking the root dir automatically, it should work there, too. Another idea is to put it into a seperate folder, e.g. "missions", and load it like -jaddons -jmissions. 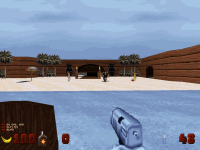 I'm pretty sure the Enforcer isn't supposed to show up at all as he is replaced by beach babe in Caribbean as far as I know. But here only the art is replaced, everything else is unchanged. It is possible that the grp I have is the cause of this problem. I'm gonna try a different approach by using supergoofy's patch that converts the SSI file into GRP file, which is what I used to play Caribbean in EDuke32 back in 2010, so then I can try launching the addon that way. Maybe it will work. 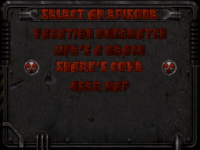 I am using vacation.grp from Megaton, so I really cannot tell how the addon behaves with different Vacation versions. Good to know you got it working. Another overly minimal report, this time on The Chronic (plus an even lesser question about Moonbase Accident). 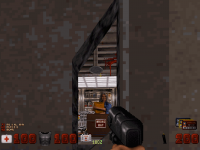 There's a door in CHRONIC2 that has a horizontally flipped and misaligned texture on one of its sides. See the screenshots to comprehend. As for Moonbase Accident, is the Buran (Shrink Ray replacement) supposed to shrink mini b-lords? As far as I'm concerned, the new weapon simply deals heavy damage to enemies, and it looks as if Shrink Ray's code for the b-lord hasn't been rewritten (I myself hasn't looked into the code, I don't understand such things so it's just an assumption). Also, which version of the mod does the compilation include? Afaik, the last version should be 1.3 and it doesn't seem to be the compilation version since 1.3 (once again, afaik) requires HRP to work properly. The thing is that Duke Caribbean Plus converted VACA15.SSI and placed in directory a cleaned vacation.grp without demo files and con files (DEFS, GAME and USER). This is why it didn't get recognized by the launcher because it was basically a different/modified grp file and this explains why nothing changed in the game besides the art. I hope supergoofy is ok with this as his DC and Caribbean patches are really useful. As far as I know, Megaton uses the same grp you get from using the patch. Mini Battlelords have 1000 health, so that means they survive the shot but at same time they shrink because of the way Shrinker works. 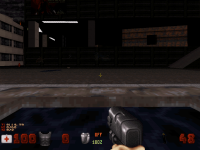 For example in the original game, you needed to aim at the mini battlelord's feet to shrink it but if you modify the CON file to make Shrinker deal damage, it will always shrink the Mini Battlelord, no matter where you hit it. And looking at the readme file, version 1.3 of the mod is included but the HRP contents were left out for some reason. I'm ok, no problem. I'm glad that the patches are helpful. I couldn't be more Goofy than I am now, but you never know. Maybe NightFright could also host them on the main HRP site just to have them here as well. It might help other people who have the original CD, though these days most people got the expansions through Megaton Edition when it was available and they didn't have to mess around with the patches. There is no point to these patches now because EDuke32 can load the SSI files directly. What you have identified is a flaw in the grpinfo system. It is also going to bite us if World Tour newcomers want to use the addon pack with the WT GRP file, which is functionally equivalent to 1.5's GRP but not identical.